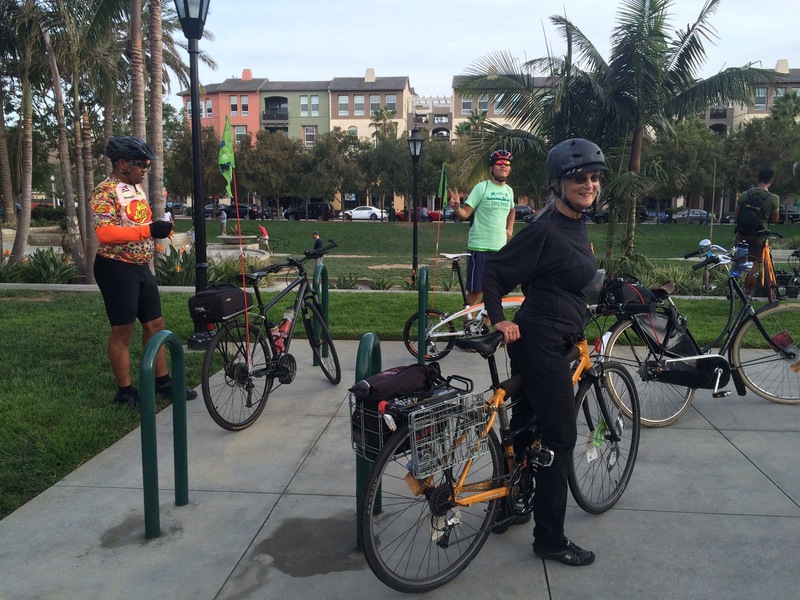 Coffeeneuring 2016-0.1: Playa Vista – WeLove2Bike! Last year, a friend I’d met through the wonderful world wide network of all things bike offered me her pass to the New Urbanism Film Festival in which one of her films from the Velo Visionaries series was being shown. Kristin lives in San Francisco, and was unable to make to L.A. for the festival that year. At first, I thought I was just getting a pass to see her film, and when I saw what else was showing at the festival, I bought a ticket to see one of the feature films. Then I decided I wanted to go back and see some more, and was delighted to realize that my pass would get me in to all of the films. This year, when I saw the 2016 New Urbanism Film Festival was gearing up for the first weekend in October, I knew I had to buy a festival pass. Kristin had two more of her Velo Visionaries films in the festival and was featured in one of the post-film panel discussions. In addition to enjoying films about topics ranging from the community-building that grew out of art projects in the aftermath of an earthquake that devastated the downtown center of Christchurch New Zealand, to following a woman who got rid of her car and explored what it would mean to live car-free in Los Angeles, to discovering the magic of the historic core of Pittsburgh, plus short films about active transportation and urban planning, there was a group BIKE RIDE. 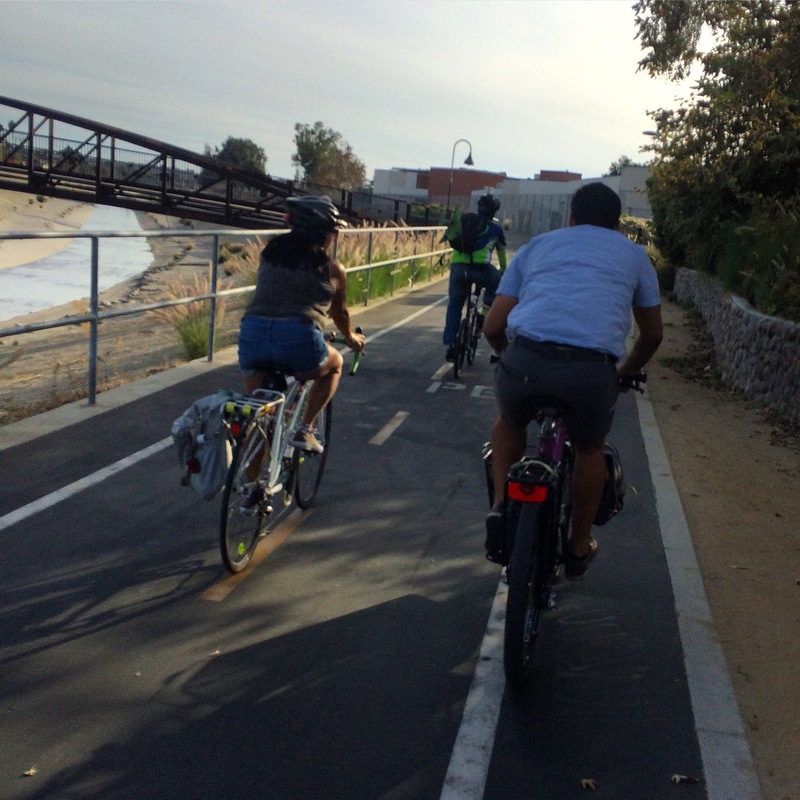 So I signed up for the ride to Playa Vista along the Ballona Creek Bike Path. 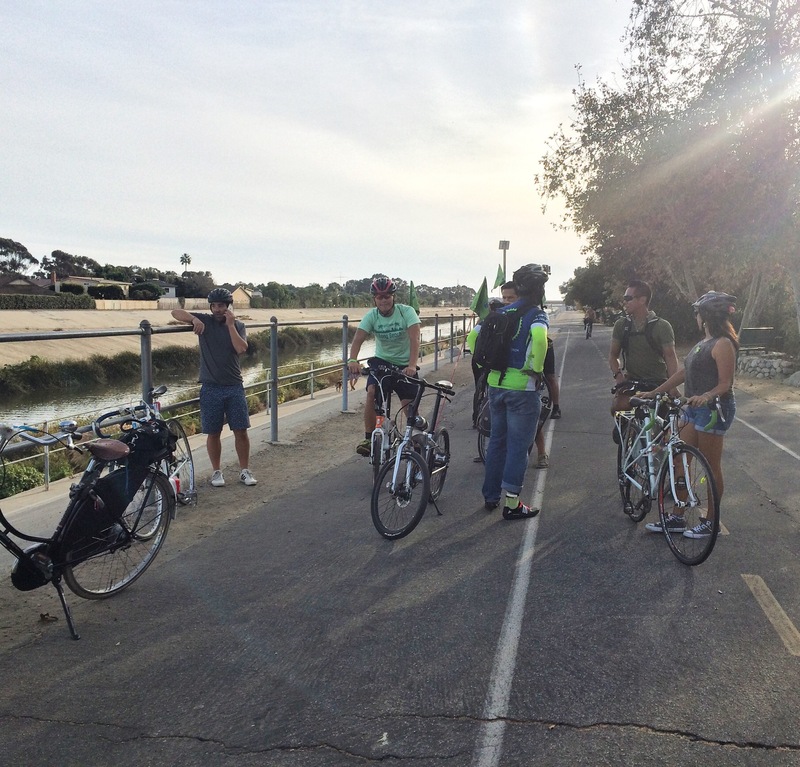 The group heads west on the Ballona Creek Bike Path. This was also the opening weekend of the Coffeeneuring Challenge. I had thought about trying to squeeze a special coffeeneuring expedition into my already-packed weekend, but it made more sense to squeeze the coffeeneuring into a bike ride I had already planned. I have been aware of the Playa Vista development that sprang up in the methane-rich swamp land between Marina del Rey and Westchester, but had never been inside. I only knew that the development project had a history of controversy and some start-and-stop before the high-density live-and-work area materialized. I was curious to see the inside. I knew this ride wouldn’t really count toward the coffeeneuring challenge, as organized rides are not permitted (although there appears to be a certain fuzziness to this rule). I decided to embrace this as an opportunity to warm up for the official challenge rides. Hardly looks like an organized ride, if you ask me. 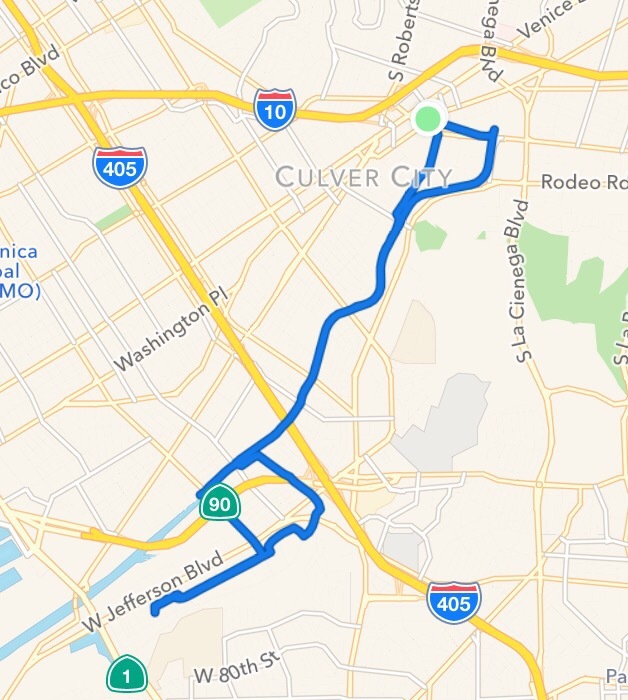 After a fun jaunt along the Ballona Creek Bike Path, we rode through Playa Vista, passing some contemporary office/work buildings and then entering some very hiply designed residential buildings that made me feel we were riding through a slick brochure. We stopped to gather at a park that had the feel of a town square, sort of. 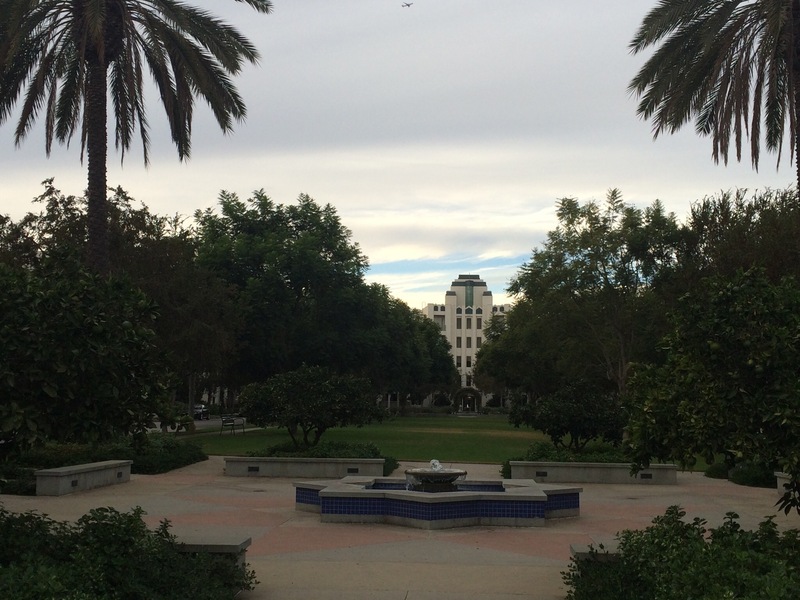 A park in a central part of Playa Vista. We had the good fortune to be given an introduction and walking tour by Stefanos Polyzoides, an urban designer who had been involved in the early stages of the development. He described for us the features that make for great cities and communities, including building heights in certain places (such as around a town square), inviting entryways, walkable streets. He explained all the challenges facing the original project, including city rules that required street widths that encouraged speeding cars rather than cultivating community feel that invites pedestrians to stroll. After years of back-and-forth encouraging the developer to consider opportunities for design and planning that would optimize the community created and getting the city on board, the developer ended up selling the land and, much to the chagrin of urban designers, sold it without preserving any requirements for how the parcels would be developed to coordinate the dreamt-of urban utopia. Here’s an article that gives the back story on that. The walking tour was educational. I enjoyed learning about the difference between “starchitects” and “marketects”, and came to appreciate the thought that goes into (or sadly sometimes doesn’t go into) the placement of garage entrances, mechanical vents, parking spaces, and doorways. Playa Vista has many things done right, and sadly, several not so great. At the end of our tour, the group was eager to head on back to Culver City for the final screenings and awards for the film festival. A friend and I were both desperate for a beverage and snack, so we dashed into the nearby Coffee Bean for a quick fix. I had a cafe au lait with hazelnut that I was able to drink during the return trip.